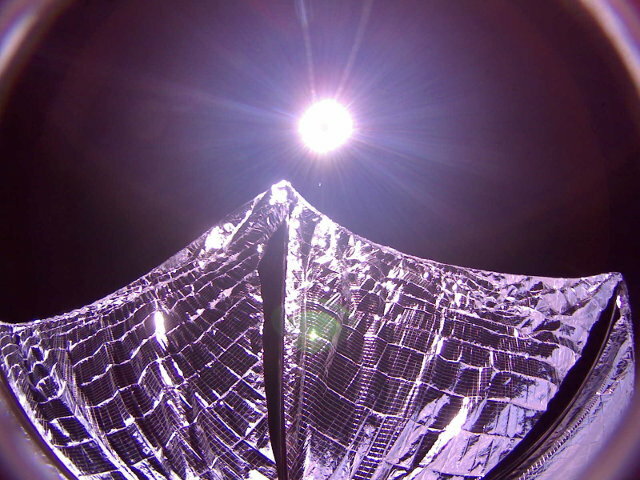 The Planetary Society declared the success of the mission to test the LightSail solar sail. Started on May 20, 2015 as a secondary payload in the launch of the military shuttle X-37B, the CubeSat-class nanosatellite that contained the solar sail has overcome various problems. Eventually the onboard systems have been tested collecting a lot of data useful for the complete mission scheduled for 2016. A few days ago, the LightSail prototype fell back into the atmosphere, disintegrating. The Planetary Society is a non-profit organization and is carrying forward the LightSail project thanks to donations. To complete the mission a fundraiser is still on, in which while I’m writing $916.150 were pledged. The money will allow not only to proceed with the mission but also to make it better known to scientists but also to the public with various initiatives. The test mission, also known as LightSail-A, had various problems. Tests are carried out exactly to find project flaws before proceeding with the complete mission but there was a risk that this test could fail. The Planetary Society has a lot of work to make sure that the mission planned for 2016 has no such problems. A few days after the launch, LightSail stopped communicating. It turned out that the problem was in the software for the telemetry data management. The file that was created grew larger, up to crashing the flight system. There was already a version of the software that corrected that bug but it wasn’t loaded on LightSail. The result was that the LightSail freezed and even sending commands to reboot the operating system didn’t work. Various attempts were made to try to take advantage of the Linux operating system used by LightSail but with no success. Only several days later a condition that resulted in an automatic reboot occurred. After updating the software, The Planetary Society started the test operations of the on-board systems. The solar panels were deployed but after a few days LightSail stopped communicating again. This time the silence lasted only a couple of days and this time the problem was in the batteries. Finally, on June 7, it was possible to proceed with the main operation, the deployment of the solar sail in Mylar. It took several attempts to have LightSail accept the command but in the end the mission was accomplished. The data and the photographs started being transmitted. The LightSail-A was in an orbit too low to really use sunlight to navigate and at that point it was already deteriorating. It was only a matter of days before the solar sail fell in the atmosphere but the problems were found and now The Planetary Society can solve them. Nanosatellites are relatively simple but solar sails are still experimental so the fact that this test was accomplished is truly a success.